The City of Cleveland has completed plowing all 8,000 residential side streets and continues snow removal operations in residential side streets. The snow emergency parking ban is in effect until 7 a.m. Tuesday, Jan. 22. Please allow plows sufficient time and room to continue to clear streets. • Please keep in mind that continual falling and drifting snow – which occurred with Winter Storm Harper – presents an extra challenge for keeping roads clear. • The City requests that, if possible, you please park your vehicle in your driveway and keep the streets clear as snow removal operations continue in residential streets. 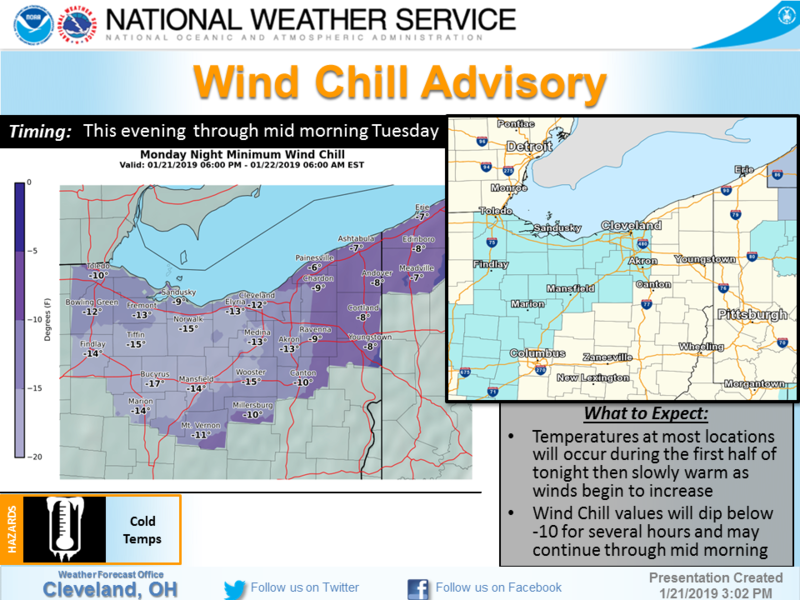 • Temperatures in Northeast Ohio will be in the single digits and wind chills overnight will reach as low as -17 degrees. • Emergency parking ban will be in effect until 7 a.m. Tuesday, Jan. 22. Click here to view the streets affected by the ban. • The City currently has 48 trucks, 7 road graders and 12 pick-ups deployed on residential side streets, and all plows and pickups are loaded with salt. • The City has more than 10,000 tons of salt. The City will provide updates as they are available. Follow us on Facebook at Facebook.com /CityofCleveland for updates.